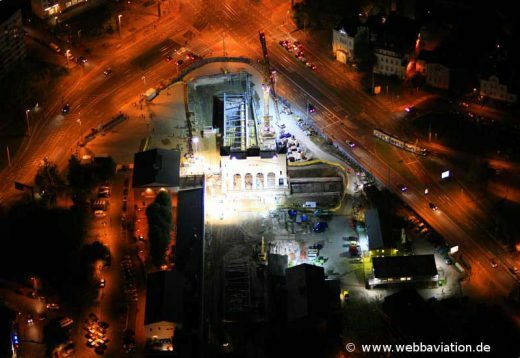 The facade from the old Bayerischer Bahnhof building – mounted on rails – had been moved to build the new U-bahn tunnel. Friday was moving back day, captured here by day and night with Jonathan Webb’s photos. The Bayerischer Bahnhof was closed in 2001. Originally built for the Leipzig-Altenburg line of the Sächsisch-Bayerische Staats-Eisenbahn it will eventually connect to the Leipzig S-Bahn. It is due to reopen in 2012.